The Vestas V90-3MW is a three bladed upwind wind turbine generator that uses pitch control and a doubly fed induction generator (50 Hz version). Its manufacturer claims to have installed over 500 units of this type globally since launch. Vestas claims the turbine povides 50% more power for roughly the same weight as the V80. The V90-3MW should not be confused with the V90-2MW, which is essentially a V80-2MW with longer blades. It is produced in both an on and offshore version. The first V90-3MW was erected in northern Germany in May 2002. 15 test turbines were deployed around the world in different climatic conditions, so that when it went into production, the V90-3MW had been tested in more sites than the V80-2MW. Following a number of gearbox problems, the V90-3MW was withdrawn for offshore sales in early 2007 before being reissued for offshore use in May 2008. Presently, the nacelles are exclusively made at the Vestas Nacelles works in Taranto, Italy. Towers and blades may come from a number of locations. Vestas produces a 3.65 MW low-wind version called the V136. Towers may weigh 160 t if 80 m tall, or 285 t at 105 m (235 t in Germany). Does not use a low speed shaft (the gearbox is integral to the main bearing). Generator is liquid cooled (with an associated additional cooling system). Different shape of the back of the nacelle to accommodate this cooling system. Yawing system which used six motors rather than four. Additional frame structure on nose cone to accommodate hub escape hatch. The V90-3MW can be specified with one of five different 'noise modes'. Each mode is set in the turbine software as part of the installation, although may be changed to another mode later. Each different noise mode implies a different power curve, so that for quieter operation, some energy yield is sacrificed. Noise mitigation is managed by adjustments to the blade pitch angle. For licensing reasons, the 60 Hz model sold in the US and Canada uses a slightly different converter system, allowing only one-way power flow through the rotor converter, rather than 2-way power flow used in the standard version. This restriction does not apply to 60 Hz models sold in other regions (i.e. Japan). 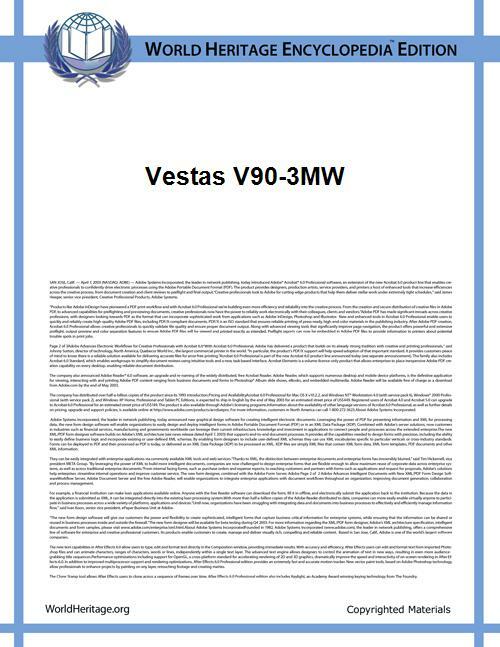 ^ a b c V90-3.0 MW Vestas, 2008. Accessed: 9 October 2011.